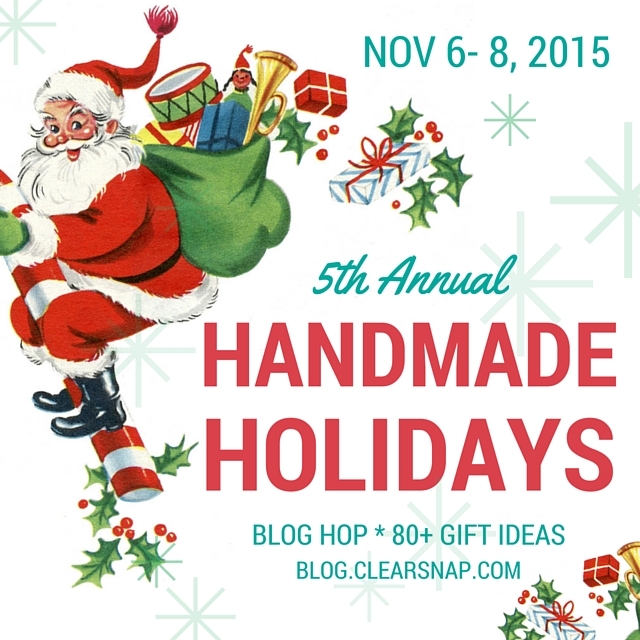 This is the 1st day of the 3 day Handmade Holidays Blog Hop, featuring over 80 gift ideas. My go to handmade gift is always jewelry. 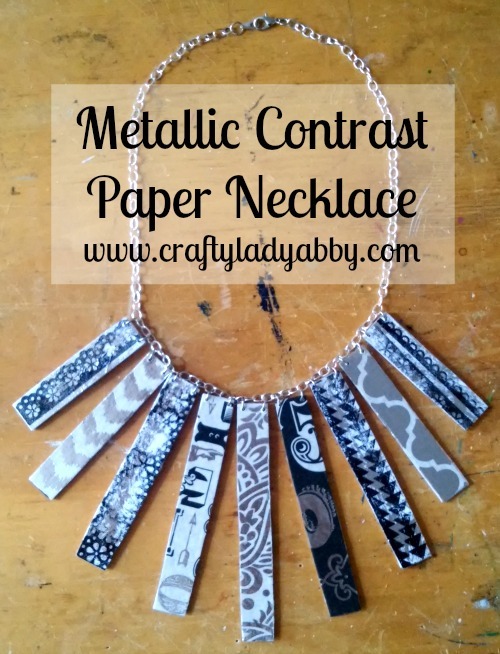 For this blog hop, I made this Metallic Contrast Paper Necklace, with sponsored products from DecoArt, ClearSnap, Thermo-O-Web, and Pink and Main. I've made several paper necklaces in the past. This one includes paper that has been hand foiled and stamped, mixed with ready made printed foil papers. Take these techniques and apply them to your own paper craft designs. After you make the necklace, craft some matching earrings! These links are to show the products only. I will not get compensated if you use them. The linked companies provided me with their products for this blog hop. Silver lobster clasp and tab. 2) Glue together matching pieces using Decou-Page Gloss and the flat paintbrush. Press together with your hands or under a heavy book. 3) On a piece of white cardstock, spread some iCraft® DECO FOIL™ Liquid Adhesive with your finger. Let dry completely. 4) Lay a sheet of iCraft® DECO FOIL™ Transfer Sheets in Silver over the dried glue. Burnish with your fingers. Carefully pull the foil sheet up. Repeat this step until you can't get any more foil to stick. 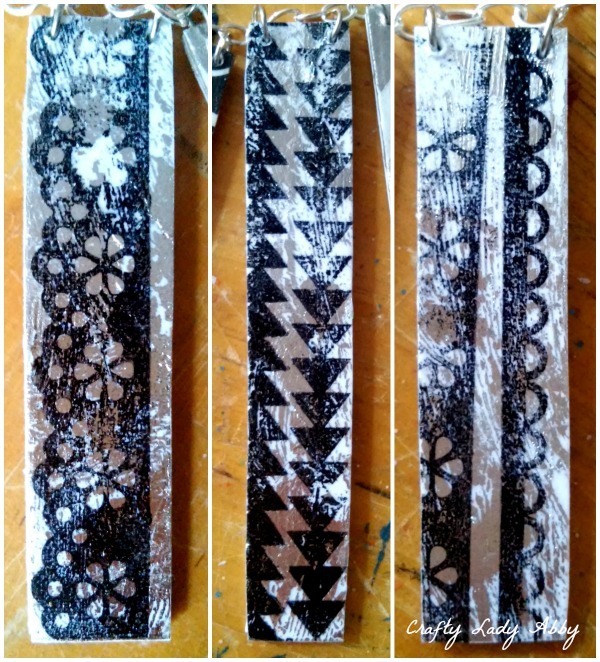 5) Using the triangles stamp from the Pink and Main Directional Borders cling stamps, the solid scalloped edge from the Dollface cling stamps, the full and half lace from the Bubbly Card Borders cling stamps, long acrylic stamp block, and Beyond Black ink, carefully stamp over the freshly foiled paper. The stamps are very sticky. I removed some of that stick by rubbing my fingers over each stamp before inking and stamping with it. Space out your stamped images, for easy cutting later. 6) Figure out which part of each paper you want to use for which layered chipboard piece. Work one layered chipboard piece and paper at a time. Apply Decou-Page Gloss with the flat paintbrush to one side of a chipboard. Press firmly onto the paper, smoothing it out. Let dry for a few minutes. Then, trim off excess paper around the chipboard piece. Seal top with another layer of Decou-Page Gloss. Let dry until not sticky. Repeat for each paper and chipboard piece. 7) Apply Decou-Page Gloss with the flat paintbrush to the back of a layered chipboard piece. Press onto white cardstock. Let dry. Trim around the chipboard pieces. Seal cardstock with another layer of Decou-Page Gloss. Let dry until not sticky. Repeat for each chipboard piece. 8) With the hand drill, make two small holes in the upper two corners of each necklace piece. 9) Insert one jump ring into each necklace piece hole. 10) Find the center of the chain. Using jewelry pliers, attach the necklace pieces to the chain, with the jump rings. 11) Add the lobster clasp and tab to the chain ends with two jump rings and jewelry pliers. That's all for this tutorial. DecoArt has several Americana Decou-Page papers you can choose from. iCraft® DECO FOIL™ Transfer Sheets and ClearSnap Craft Inks come in many colors. Border stamps work best for this project, but feel free to mix up the styles. 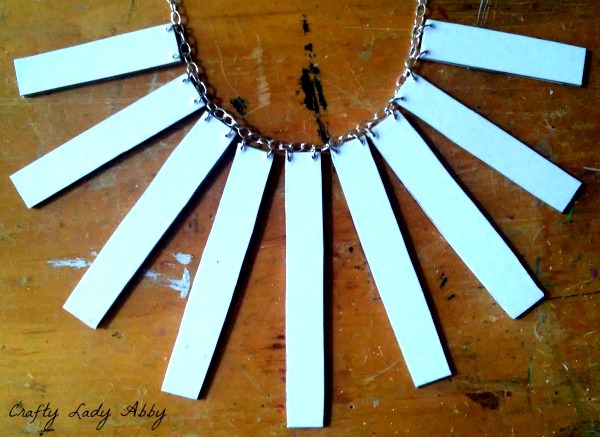 Use different colors of cardstock and chain. Personalize the necklace for the recipient...or treat yourself! Whatever you chose to make, have fun with it! Happy Makery! These are the participating blogs for today, November 6th, 2015. 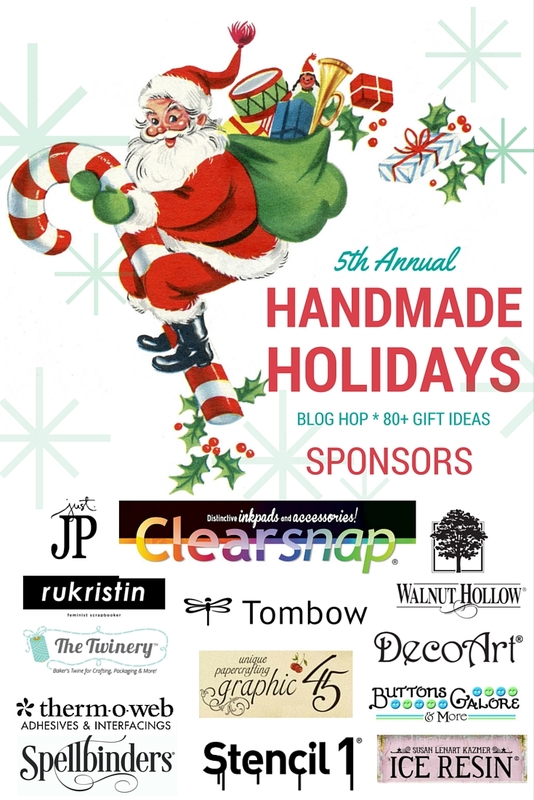 Handmade Holidays is sponsored by these companies, who graciously are offering goodies for a mega crafty giveaway! Sure to get you in the handmade holiday gift mood! 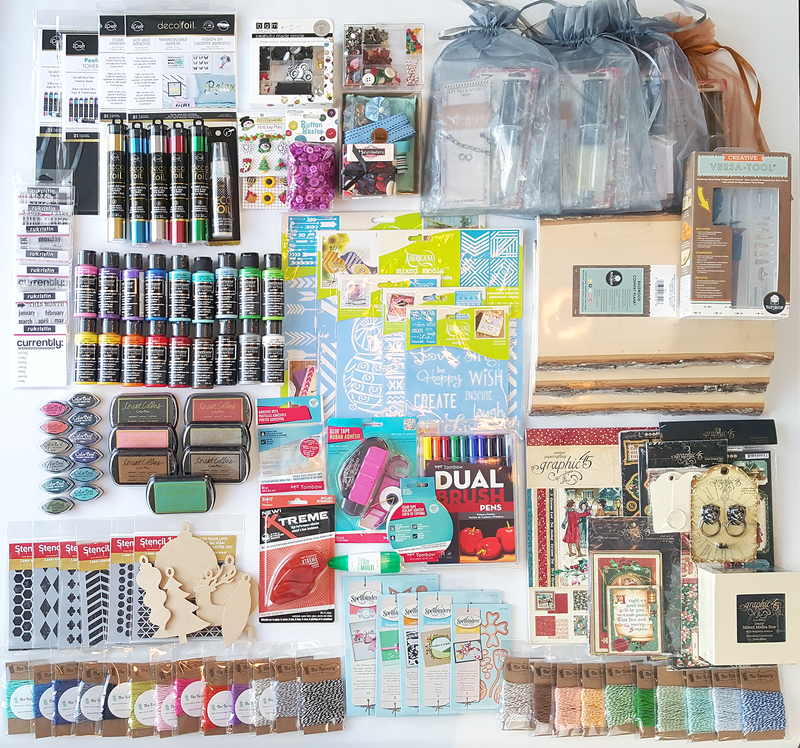 This is the mega prize pack with over $600 of craft supplies! Enter to win, on the Rafflecopter widget below! I'm even in awe! Good luck and happy makery! Waw!! con cualquier cosilla se puede hacer un collar precioso y muy moderno!! Seeing this, I never would have guessed what it was made of. What a great idea. I never would have thought of this. How clever and unique, very pretty. Very nice necklace! Thanks for the tutorial. THANK YOU for sharing your project & tutorial Abby!!! I don't use my craft drill very often, might have to get creative for / with my nieces!!! My daughter would love this necklace! Even the colors are perfect! Thanks for the tutorial! Now, that's a signature necklace. Thanks for the tutorial. How clever and fresh idea! 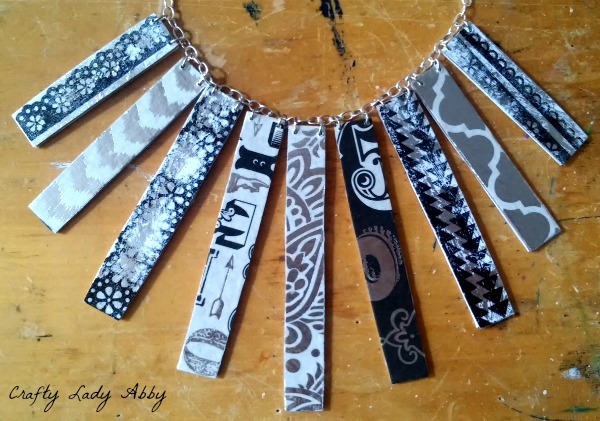 Love this deco art necklace piece with beautiful foiling! What a unique and fun necklace!!!! I can see my neighbor wearing this!! TFS! What a totally cool necklace! I love the idea as well as your creation!